Summary: This goal of this project is to improve nesting beach habitat and marine conditions for nesting sea turtles and hatchlings on St. Joseph Peninsula, and juvenile sea turtles that utilize near-shore habitats in St. Joseph Bay. This will be accomplished through the design, development and distribution of printed materials that inform visitors and residents about the sea turtles, the many threats that they face, and how we can all play a role in helping to reduce these threats. Although historically the St. Joseph Peninsula Turtle Patrol has received some funding from Gulf County, Florida, the County has no specific budget for sea turtle education. Additional expenses are accrued that are beyond the scope of the Turtle Patrol’s monitoring work, including providing educational programs and materials aimed at mitigating the negative impacts caused by improper lighting, beach driving, beach debris, and other dangers to sea turtles. These negative impacts have increased as increasingly greater numbers of visitors and residents enjoy our once pristine beaches and Gulf and Bay waters. Results: Grant announcement published in The Star newspaper, Tallahassee Democrat newspaper, and announced on Oyster Radio in April, 2014. Production of all printed materials: Help Save Sea Turtles rack cards, Sea Turtle Fun activity sheets, Junior Sea Turtle Ambassador cards, Stranded or Injured Turtle magnets, Lights Out for Sea Turtles window cling sheet, Save Sea Turtles, Don't Litter reusable bags, Sea Turtle Awareness Survey. Purchased brochure holders and display fixtures. · Printed materials, including Help Save Sea Turtles rack card, Sea Turtle Fun activity sheet, Junior Sea Turtle Ambassador cards, Stranded or Injured Turtle Magnets, Lights Out for Sea Turtles window cling sheets, Save Sea Turtles, Don't Litter reusable bags, were distributed to Property Management Offices, Gulf County Tourist Development Council, and Gulf County Chamber of Commerce. 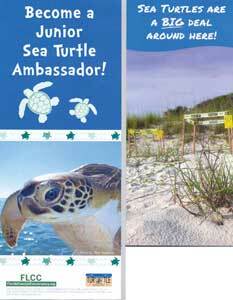 Printed materials were also distributed at sea turtle nest evaluations on St. Joseph Peninsula in August, September, and October, 2014; Florida Scallop and Music Festival in September, 2014; Friends of St. Joseph Peninsula State Parks Appreciation Day, September, 2014; Friends of St. Joseph Bay Preserves Fall Bay Day in October, 2014.